The Mexican native hopes to change rye’s reputation by highlighting the spirit in various cocktails that appeal to both men and women. Four of The Rye Bar’s seven signature drinks ($16 to $22) feature the whiskey, including the Old(er) Fashioned, made with (ri)1 straight rye, Hidalgo Pedro Ximenez Sherry, Luxardo Maraschino cherries and orange peel. 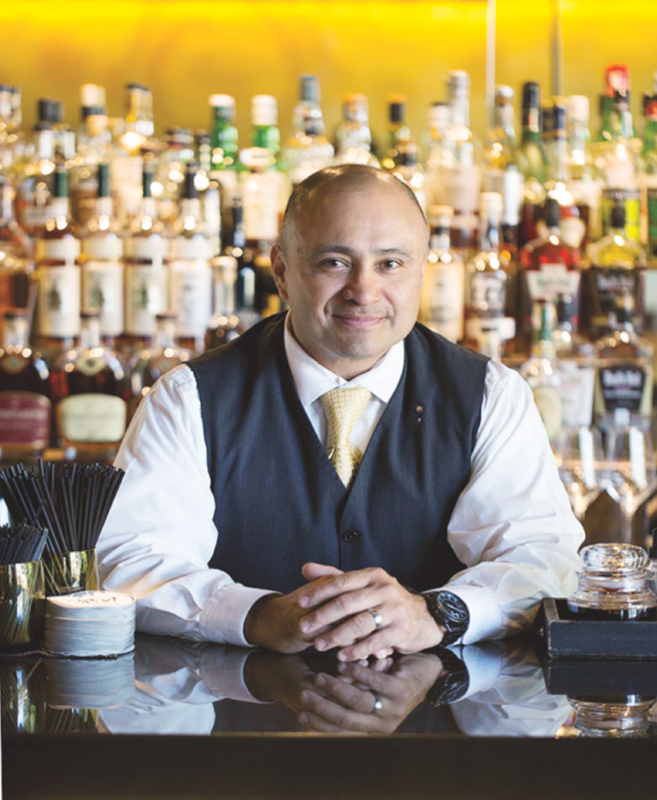 “It doesn’t matter who you recommend that cocktail to—they just love it,” says Cervantes, who spent two decades behind the bars at acclaimed D.C. restaurants like chef Mark Miller’s Red Sage and chef Michel Richard’s Citronelle before taking over The Rye Bar. 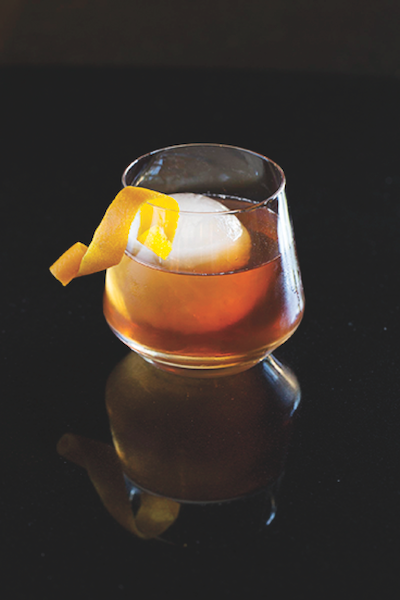 One of the venue’s best-selling cocktails is its Barrel Aged Manhattan, comprising Dad’s Hat Pennsylvania rye whiskey, Dolin Rouge sweet vermouth, Byrrh Grand quinquina and house-made orange bitters. It’s aged for 10 to 12 weeks in charred white oak barrels, and Cervantes can go through a full 330-cocktail batch during a busy week. “That’s a drink that people hear about and tell other people about,” he says, noting that the bar has five barrels aging at a time. For customers who want a different spirit base, there’s The Moral Hazard, mixing Greenhook Ginsmiths Beach Plum gin liqueur, Dolin Blanc vermouth, Shrub & Co. Spicy Ginger shrub and fresh ginger. “We do really well with that one. We buy five or six cases of Beach Plum at a time,” Cervantes says. He also makes cocktails on the fly for patrons. “That’s a part of my job that I really love,” Cervantes adds. Another popular non-whiskey drink is the “Not an Apple” Martini, blending Russian Standard vodka, basil, lemon juice, simple syrup, Domaine Carneros Estate Brut Cuvée sparkling wine and a rinse of Pernod absinthe. “Female guests were always asking for Apple Martinis, so I decided to play with a couple ideas,” Cervantes explains. 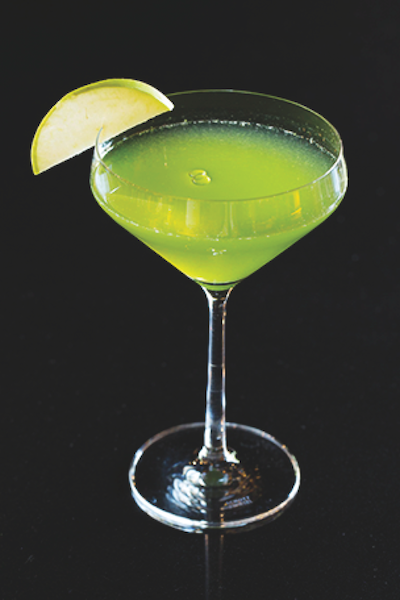 “I muddle the basil and strain it to get a pretty green color.” He notes that the absinthe serves as an aromatic component to balance the strong basil flavor. At The Rye Bar, Cervantes aims to offer simple but sophisticated cocktails. “We want to be creative, but we don’t want to overdo it,” he says. This approach to the cocktail experience has made The Rye Bar a destination for locals and travelers alike. “We’re committed to quality and to people having a good time,” Cervantes says. Combine whiskey, vermouth and quinquina and age in charred white oak barrels for 10 to 12 weeks. To serve, pour 4 ounces into mixing glass with ice and stir until well chilled. Strain into a rocks glass over one large ice cube and add orange bitters. Garnish with an orange peel. 1 Peel 10 oranges and sun-dry peels for eight hours. Combine dried peels with 1.75-liter bottle Everclear, ½ cup coriander seeds, ½ cup peppercorns, ½ cup sesame seeds and 2-3 drops orange bitter in a large container and store for six months before using. Rinse a Martini glass with absinthe and set aside. Muddle basil leaves in a cocktail shaker. Add vodka, simple syrup, lemon juice and ice, shake and strain into the Martini glass. Top with a splash of sparkling wine and garnish with an apple slice.